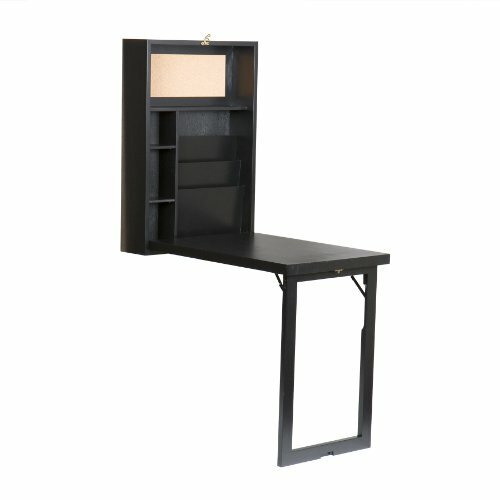 Are you’re looking for a small computer desk? 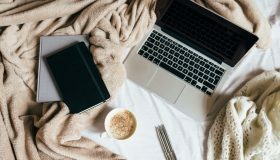 Whether you have a small area to work with or just don’t want a big piece of furniture taking up space in a room, there are many styles of compact computer desks to suit your needs. 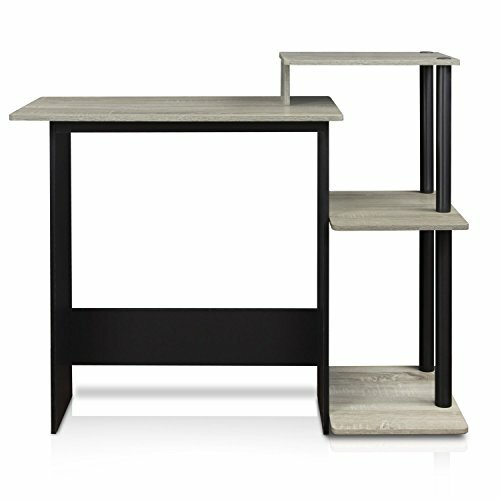 These are your standard computer desks with smaller widths and depths. They are good for small rooms such as a den, kids’ bedrooms, college dorm, etc. They have storage and features like drawers, shelving, PC tower storage, pull-out keyboard tray. PROS – Affordable, choose from a few different design features (eg. round or square shelves, keyboard tray, L-shape option). CONS – Not the best quality but good enough, recommended to use glue on all joints for extra strength. Great for any small room. Also, their minimalistic designs are aesthetically pleasing so they’re not eye-sore if you need to put it in a main room of your house or apartment. These are very versatile and can be used for more than just a computer desk. 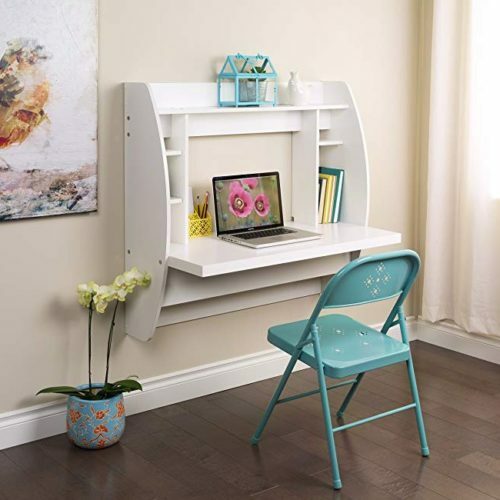 Maybe a workstation for just your laptop in the evenings or weekends. Maybe a place for the kids to do their homework. Maybe it doubles as a dinner table or perhaps it won’t even be used as a computer desk at all. Also, They’re typically lightweight due to minimal material, easy to assemble, and easy to move or relocate. PROS – Includes a cable organizer tray, super easy assembly, very high quality, fantastic customer service. 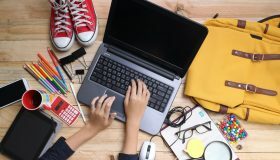 CONS – The only customer complaints were a few who received the product damage due to the shipping company – nothing bad to say about the desk itself. Out of sight, out of mind. 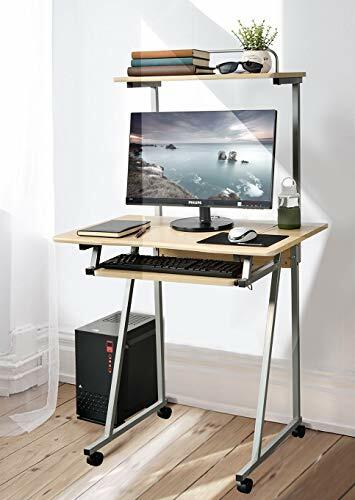 Foldable desks are ideal if you need a bigger work area (while you’re working) but don’t have enough room to keep an additional piece of furniture permanently. These desks collapse and fold flat for easy storage when you’re not being used. PROS – Very sturdy. A handful of reviews from customers who use this desk as a sewing machine table and state that it doesn’t wobble while the sewing machines are running. CONS – The spring mechanism for the fold out legs is extremely strong which makes the desk so sturdy but, keep your fingers clear! These are a nice looking wall cabinet when not in use. Open it up and the desktop unfolds down with legs to support while the other side remains anchored to the wall. Think of a Murphy Bed or a built-in ironing board. 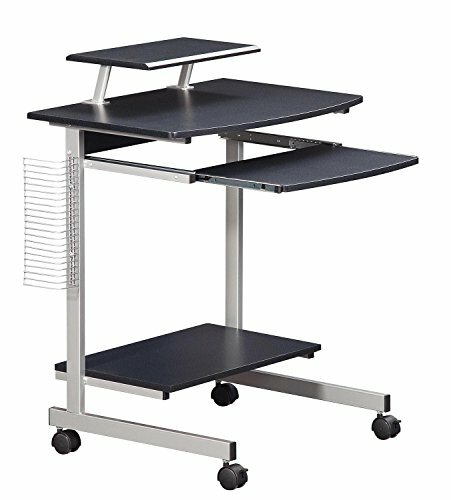 These have virtually no footprint when folded up but provide ample work area and some models even have sufficient stationary storage. PROS – Solid construction. Visually attractive. Convenient. Seems to be the perfect height for many. CONS – Assembly instructions aren’t the best. There is a paper holder slot at the bottom right of the desk that doesn’t have a bottom so paper slips through it. Floating desks are mounted to the wall. They provide a decent size work surface and often have shelving and storage built-in. They don’t have legs so there is literally no footprint on the ground. And although they don’t fold up flush to the wall, they have a nice clean look and still leaves your room looking as spacious as can be. 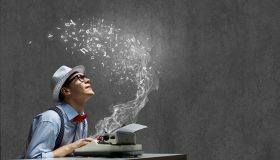 PROS – Very highly recommended! Looks great, keeps cables and cords out of sight. “Beyond expectations”. CONS – Installation to the wall can be a challenge – you’ll likely need two people and must secure to wall studs. These small computer desks are on caster wheels. They won’t take up much space to begin with and can be easily wheeled around to wherever you want, and out of sight if you need. These also tend to be adjustable in height so you can sit or stand anywhere you’re comfortable. 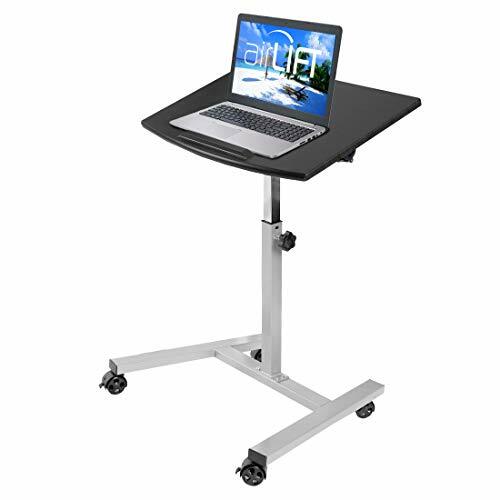 Tilt the tabletop for a more natural working position while typing, writing or drawing. PROS – Adjustable height. Table can be angled or flat. Very well made, quality product. CONS – A few complaints about receiving the product with scratches however, customer support has been great at satisfying the issue. These are ultra compact and portable. There are a variety of styles out there but they can sit on top of a table, counter top, directly on your lap, or straddle over you while you lay in bed! These won’t work with a desktop PC but are perfect for a laptop, tablet or for writing. PROS – Built-in dual cooling fans. Adjustable height. 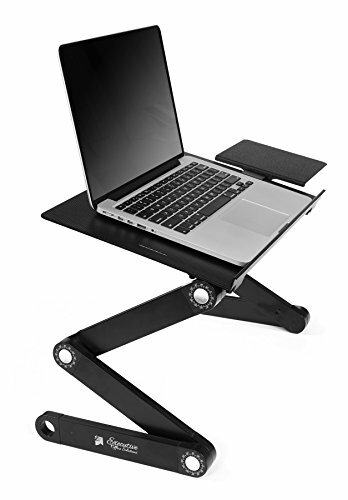 Can be used as a standing desk, works great on the couch and in bed. Lightweight and sturdy. CONS – Might be too small for a 17” or larger laptop. 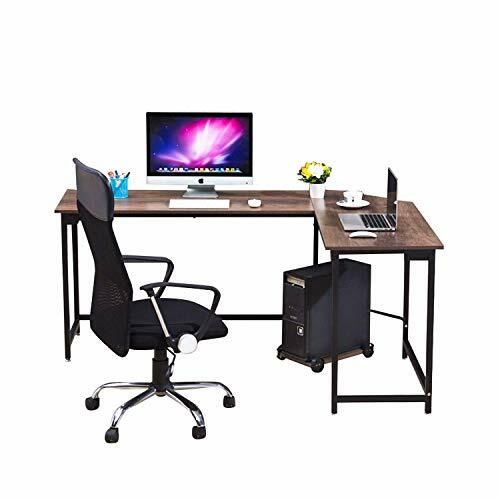 This is a very simple desk, but you can personalize it to meet your tastes, since it comes in more than 10 colors, including black, blue, white, and red. 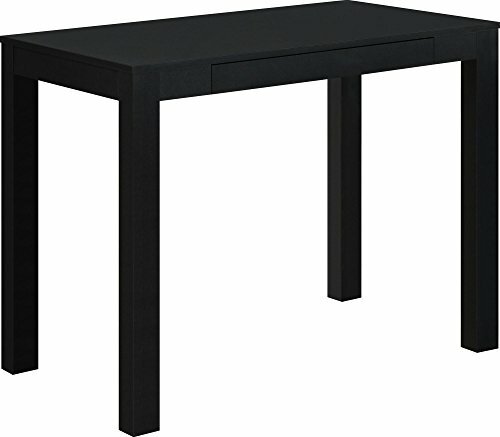 It looks like a regular table with a flat top and 4 legs, but it also has a drawer in the front, for you to hold important things like pens, paper, or a calculator. 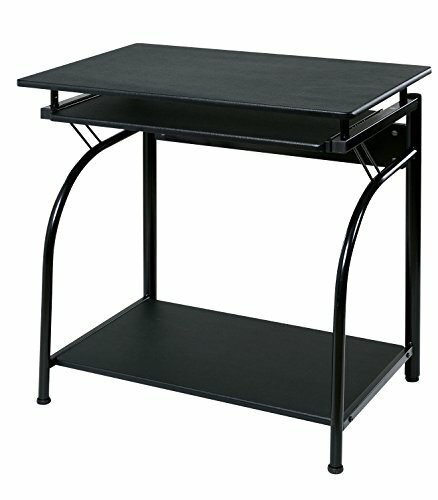 This desk is likely to fit pretty much anywhere you need it to go and it can hold whatever type of computer you have. A really great thing about this desk is that you can always use it for something else if you end up upgrading your computer desk. 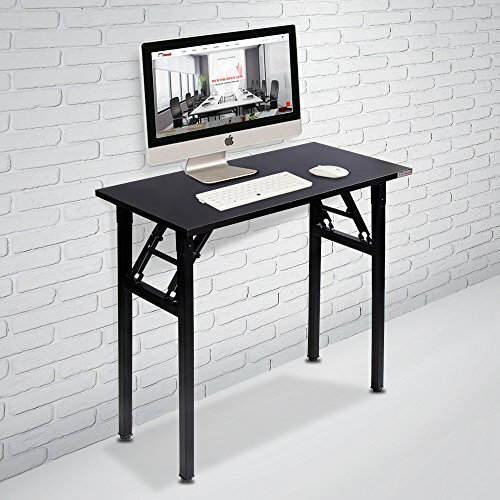 It is suited for televisions, vanities, and other things, in addition to being a great computer desk. 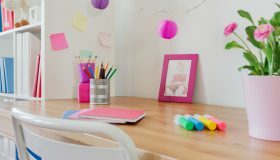 It would also be perfect if you need to have more than one desk in a room or if you are using it for a child’s room, since it doesn’t take up a lot of space. The possibilities are endless with this table. This is a simple table that incorporates sophisticated ideas to save you some space in your room or office. It comes in black or dark brown, both of which have metal accents. This desk is also on wheels, so it won’t be hard to move around, in the case that you need to. The wheels also lock, so you don’t have to be concerned that your computer won’t stay put. 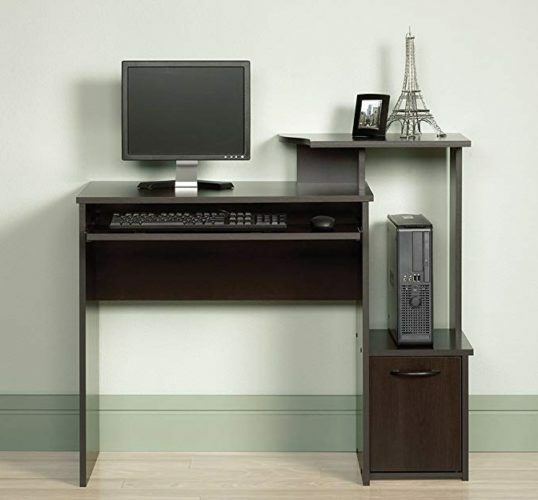 The coolest features of this table include a bottom shelf for a tower or peripherals, and a shelf just for a monitor. 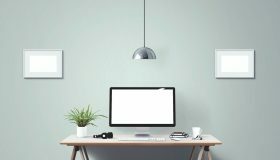 There is also a shelf for the keyboard, and another shelf in between for anything else you need to place on your desk, such as a mouse or speakers. There are even CD racks on the side, so you can have all of your most important software or music right beside you at all times. The monitor shelf can be placed on the table at a number of different angles, and the steel frame of the unit is resistant to scratches. This means the desk will stay looking new for a long time. It even comes with a 5 year warranty, which is quite a promise. This is a classic wooden desk, which has many features to take advantage of. For one, its compact size is great for any type of room and for people of all ages to utilize. This one is has a nice dark brown color to it, which should look great in many different settings. It has a shelf for the keyboard to slide out of, a shelf for your speakers or printer to sit comfortably, and another space for your computer tower to sit out of the way. As a bonus, there is also a hidden storage area underneath the tower shelf, which makes this one a great place to store extra peripherals or other things you may need when you’re using the computer. It also makes the desk look more sophisticated. There is a lot of room on this desktop for it being small, so you’ll have room for all the things you like to use. 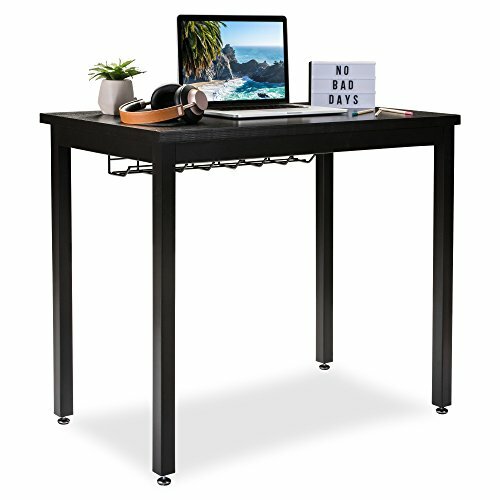 It is heavy duty for something of its size and is great for setting up your computer out of the way or in some space that is hard to utilize with other types of desks or tables. 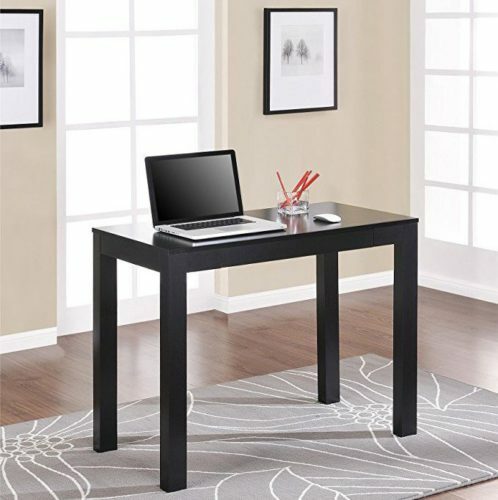 Click here for a more detailed review of this desk. This is what is known as a floating desk, so it must be affixed to the wall. However, this means you can place it anywhere on a wall that suits your needs. This ensures it will be secure and you can’t really bump it or mess it up somehow. This model comes in black, dark brown, and white, so there are options to choose from. The desk itself has a lot of storage, including a large desktop for your computer, as well as storage on three sides for everything else you need. The most important aspect is that you can place it at whatever height you need to accommodate your frame or the chair you’ll be using with this table. 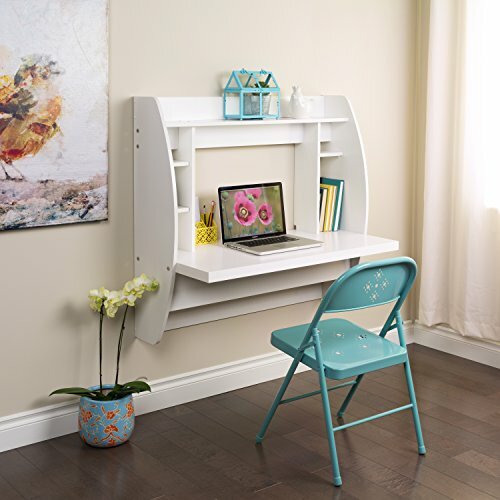 This makes it great for small apartments, dorms, or a child’s room, especially if there’s no room for a desk to sit on the floor. 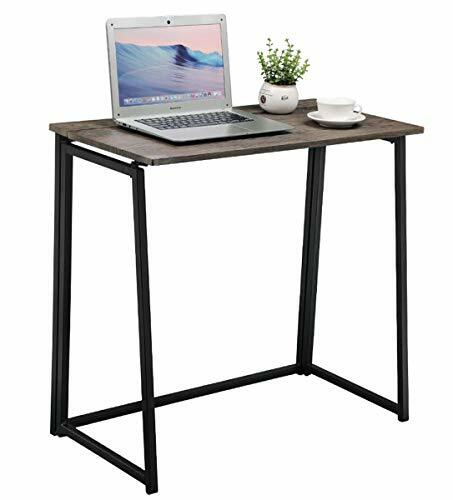 The table can hold up to 100 pounds, which is pretty sturdy and there’s a hole in the top to run wires through, so you don’t have to plan ahead for that. It affixes to the wall with a special rail system, which you can rely on. 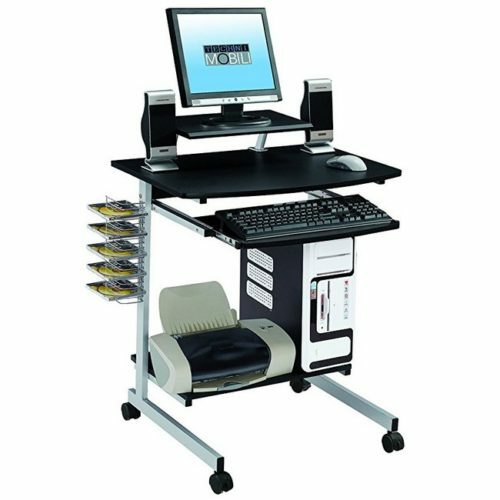 The product also comes with a 5 year limited warranty, so you can be sure that you can enjoy this desk for a long time. 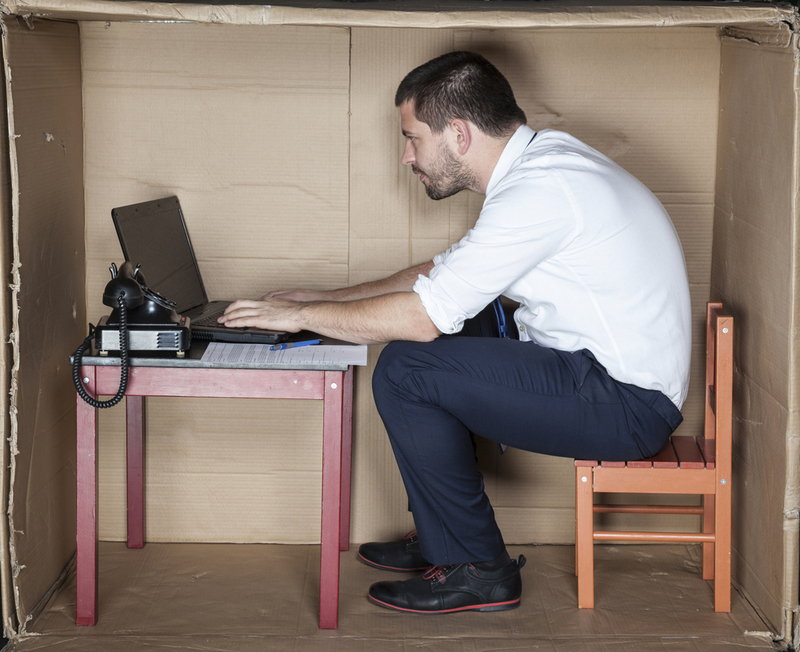 Finding a small desk for your small space isn’t as hard as it used to be. 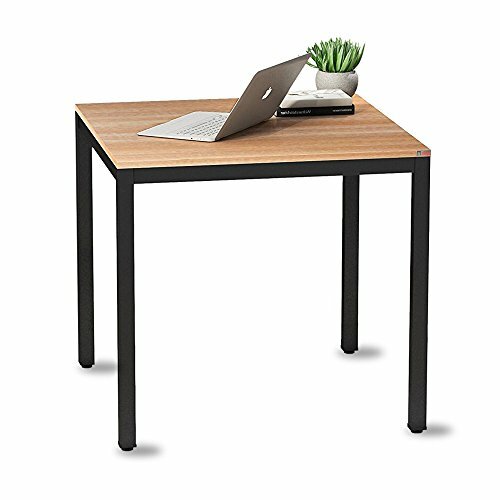 There are so many desks that can fit perfectly into small rooms or areas, and most are really attractive products as well. You don’t have to purchase something ugly just because you don’t have a lot of room. Most items have shelves for all the basics and are easy to put together too. They also come in different colors and designs to fit your furnishings, and so they can be good for men or women.